On 27 October 2016, under the patronage of the Federal Minister of Education and Research, the State Secretary Georg Schütte honoured the winners of the Green Talents Competition 2016 during the alumni conference in Berlin. "We strongly believe that bringing together young and dedicated researchers from all over the world is the first and very important step towards a more sustainable future. We are convinced that it is crucial to foster international cooperation in sustainability science in order to jointly address the global challenges the world faces today." 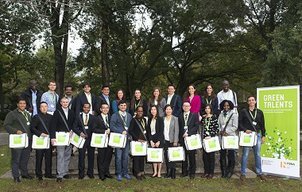 For the eighth time a high-ranking jury of experts selected 25 ‘green’ visionaries from 22 different countries out of over 750 applicants as the "Green Talents 2016", tomorrow's leading scientists in the field of sustainable development. 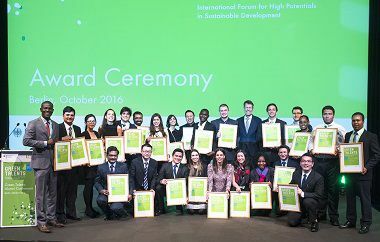 Part of the prestigious award was an invitation to participate in the "Green Talents – International Forum for High Potentials in Sustainable Development", a two week travel to Germanys sustainability hot spots within the research field. During the Science Forum the Green Talents not only gained insights into the country's innovation system but also into funding possibilities, institutes and universities as well as exchanged their own ideas and projects with leading experts of their field during individual appointments. The award year 2016 was connected to the Science Year thematic focus "Seas and Oceans". Have a look at the profiles of the awardees and the sites and sustainability hot spots they have discovered during their travel. 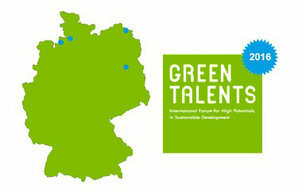 Furthermore the Federal Ministry of Education and Research invited all Green Talents alumni worldwide as well as all institutions and experts involved in this initiative to the Green Talents alumni conference in Berlin on 27/28 October 2016. During two days the Green Talents and all experts had the possibility to foster collaborations, to network and to exchange to specific topics. 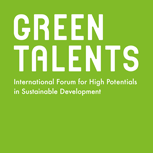 The Green Talents - International Forum for High-Potentials in Sustainable Development 2016 took place from 15 October (day of arrival) to 30 October (day of departure). Depending on the thematic focus of each competition, the destinations are changing every year. In view of 2016 being the "Seas and Oceans" Science Year have a look at where we have been... more: Science Forum 2016. The winners have been selected by a jury of renowned German experts, whose members in 2016 include Roland Busch, Cristian Gebhardt, Beate Jessel and Norbert Jürgens. more: Jury 2016. 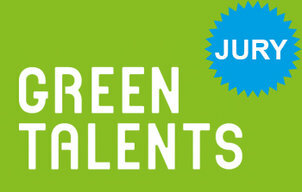 We are proud to announce the Green Talents awardees 2016. Learn more about their bios and research here. more: Awardees 2016.